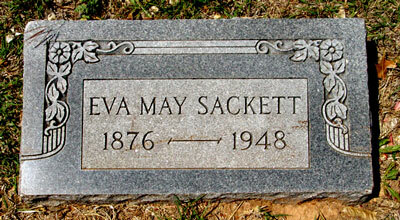 May Sackett, daughter of Henry Sackett and Mary Anna MacNamara, was born in Camp Colorado, Coleman County, TexasG, on 9 December 1876.1 She died aged 71 at the Overall Memorial Hospital, Coleman, TexasG, on 10 September 1948.2 She was unmarried. "Texas Death Certificates 1903–1982", digital image, Ancestry.com, "Sackett, May, d. at Overall Memorial Hospital, Coleman, Coleman County, Texas, 10 Sep 1948, res. Route 1, Coleman, b. Camp Colorado, Texas, 9 Dec 1876, age 71-9-1, single, occ. ranching, father Henry A Sackett b. England, mother Mary McNamara b. Washington DC, informant Fred Sackett, Coleman, cause pulmonary TB, bur. Coleman, 11 Sep 1948."